Most of my readers probably know by now that I’m a Christian. What might surprise you is that I don’t celebrate Christmas and Easter as Christian holidays. We do the secular stuff with our families, exchanging gifts, hunting for baskets, but we do not recognize any affiliation of those holiday traditions with our faith. We recognize Christ as our savior, remember his birth, life, death, and resurrection, but we do not do it just because it’s Easter or just because it’s Christmas–holidays that ultimately have pagan roots and nothing to do with Christ, despite the emphasis put on Him during this time by many. Not that I despise that emphasis, it’s actually refreshing, but we choose to keep these holidays secular while keeping our focus on Christ year-round. Make sense? Hello? Is anyone left? Hopefully I didn’t lose everyone by starting out on such a serious note. I have lots of thoughts on this subject…and maybe I should share them some day. I was thinking about starting a “my faith” page on my blog where I can file my thoughts on spiritual matters in more detail. Let me know if you’d be interested. 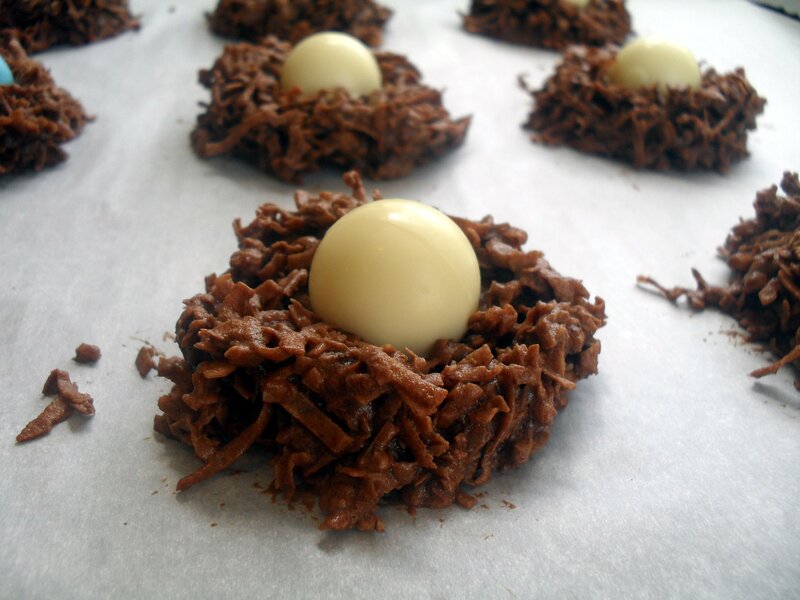 Anyway, whether you celebrate Easter or not, these moist chocolate macaroons shaped into nests with white chocolate truffle “eggs” are a perfect spring-time treat! I made these a couple years ago and nearly forgot about them until I ran across the photos I took. Perfect timing! I hope you enjoy them, I know our family did! Move the oven racks to the upper and lower thirds of the oven and preheat to 275 degrees. Cover two cookie sheets with parchment paper. 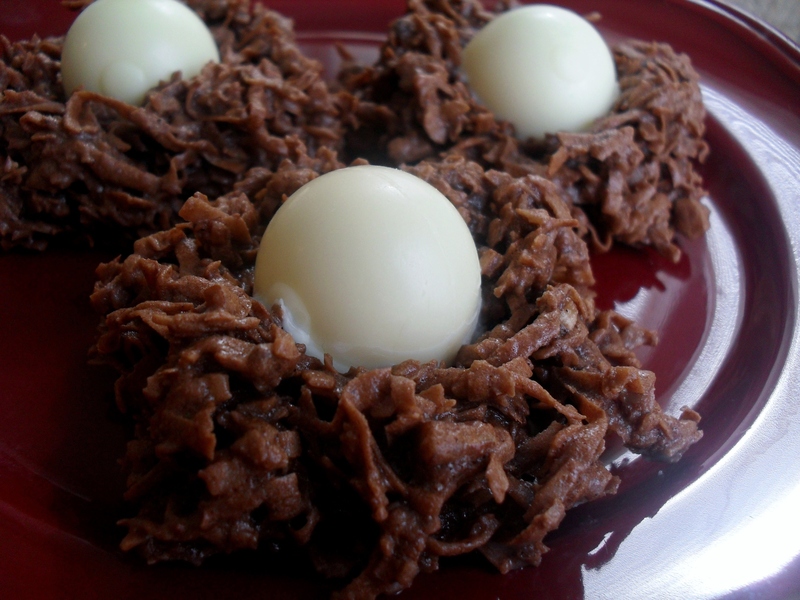 Melt baking chocolate in a small bowl in the microwave on high 30 seconds at a time. Stir after each stop until melted; set aside. With a hand mixer or stand mixer, beat the egg whites on high until stiff and glossy. Add the salt, vanilla extract, powdered sugar, sweetened condensed milk, and chocolate. Beat until mixed. Stir in the coconut and hazelnuts. Scoop into mounds with a small (size 24) ice-cream scoop or a 1/4th cup dry measuring cup. Place on cookie sheets and make an indent in the middle with your thumb. Place both cookie sheets in the oven and bake for 20 minutes. Switch the cookies to the opposite shelf halfway through baking. This will prevent over-browning. Meanwhile, unwrap the candy. Move cookies to a cooling rack and allow to sit for five minutes, or until they are barely warm to the touch. If you place the truffles on top while they are more than barely warm, they will melt into goo. If you are using candies with a shell, wait until the cookies are cool to place them on top, or the shells will crack. 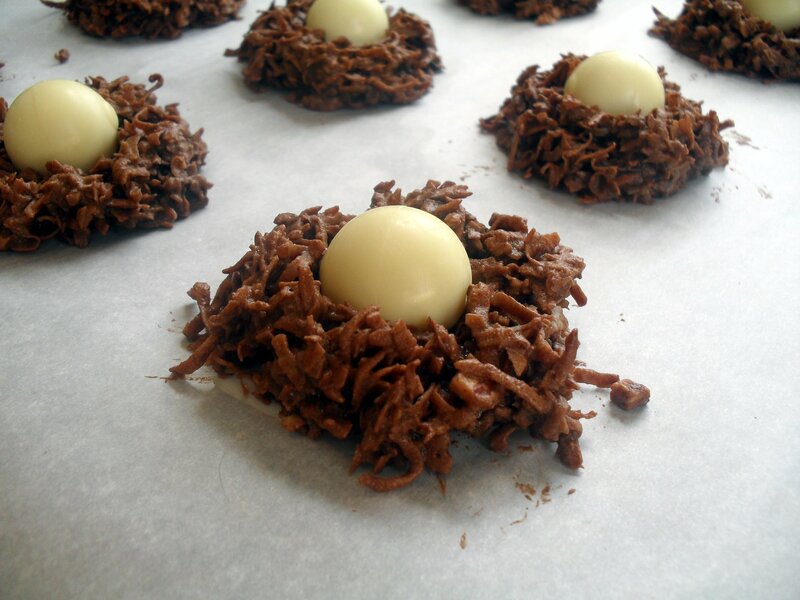 For the truffles, working quickly, set the Lindt balls on top of the cookies. Let cool completely. The Lindt balls may drip a little so you may want to place a sheet of parchment underneath the cookies. *To toast the hazelnuts, place them in a small bowl and microwave on high for 30 seconds. Stir, and microwave another 30 seconds. Immediately rub together in a paper towel to remove a little of the excess skin. Leave most of the skin on. Chop coarsely and set aside. Makes 16 to 18 large cookies. 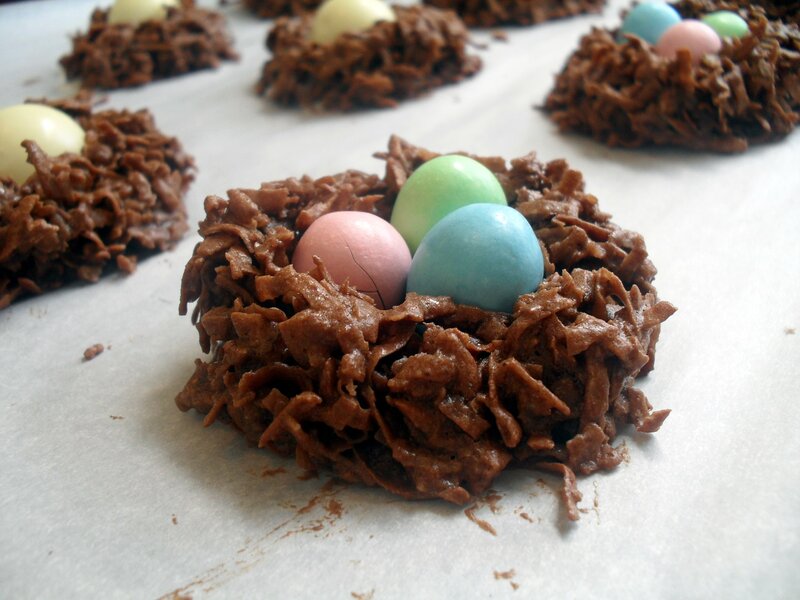 Posted in Cookies and tagged bird's nest cookies, Christian holidays, christmas, Easter, Easter basket, gift, holiday, homemade, Lindt white chocolate truffles. Bookmark the permalink. Sorry I have to politely chime in! :-) I applaud you for recognizing the pagan roots of these (and many other) holidays! I would imagine your main goal is to please and not to offend God by doing this. Do you think that God approves of still doing the “fun” part of the holiday like the baskets and egg searching? YOU may know your beliefs and faith but someone seeing you do these things still associate these things with Easter. I personally try to think about how God views what I am doing and whether He would approve. Whew, okay, onto those awesome cookies! They look amazing! And I totally belief that no holiday is necessary to make cookies! My kids just saw these and totally want to make them, thanks! I haven’t been to the Kingdom Hall in…13 years or so! I don’t see much point, but now you’ve got me kind of wanting to go, just to observe the JW tradition and hear the talk about the Memorial because it’s been so long. We are both so busy we never even finished our convo about the trinity (I think I dropped the ball, but I still have notes that I am meaning to send to you! ), but that’s actually just one small thing I disagree with in that religion and why I chose to become “just” a Christian. I am so going to get an email to you…before I die! lol I have Thursday off…I will let you know if we make it. Did you know that even our days of the week are Pagan? Sunday is in honor of the sun god, Monday is in honor of the Moon god, I forget about Tuesday, Wednesday is Wooden’s day, Thursday is Thor’s day, Friday is Fris day, and Saturday is someone-or-other’s day too. Anyway, sometimes things change over time away from their original meaning as they become socialized into regular society and loose their original religious meaning. No one thinks that you’re giving honor to the moon god just because you reference that today is Monday. Just like people don’t automatically think you’re a pagan because you did an egg hunt. If it’s sinful to partake of anything with these roots, you would be sinning by using the days of the week. Realize that I mean partake of the social side of it- the side that society has changed into a social holiday… partaking of the holiday in a spiritual way- (celebrating any “Christian holiday” or religious celebration/ceremony/memorial God didn’t specify in the bible) would be adding to His word. We read in Revelation 22:18-19 that punishment awaits any who add to God’s word. God gave us ALL things pertaining to life and godliness (2 Pet 1:3)… if He wanted us to have a yearly memorial He would have told us. Instead, He commanded a weekly memorial- every Sunday. Thank you, Tracy, you put that so well. Thank you so much for sharing your faith in your blog! This is Karen Ausburn in Dover, Fl, I am friends (very old..) with Teri and Jerry Blount and I had written last year when I made the discovery of where you worship and being a Christian. I really enjoy your blog and I think it is a great idea to share your thoughts as you do. You never know who is reading…..and never know what good you may do or seeds you have planted. Some dear friends of my Ken and Norma Weliever will be moving from Tampa to work with the Hickman Mills congregation in June. If you have a chance to meet them, your life will be richer for the connection! Keep up the good work, Veronica!! Yes, I remember you! Glad to know you’re still around. :) I’ll have to Google “Hickman Mills”–I have no idea where that one is. Thanks for the heads up! We usually do easter baskets – even though now we put $$ inside the eggs instead of candy! Since my step-son lives in Texas, we will probably just send him a care package. I’d love to read any spiritual thoughts you want to share! =) I always enjoy your perspective. Those cookies look awesome. I think you should feel comfortable sharing anything you want on your blog, if someone doesn’t like it they can just choose to not read! Thanks, Rhonda. I would be putting it on a page, not on the main blog, so people wouldn’t even get updated. It would be totally by choice if anyone wanted to read it. The only holiday I don’t really care to celebrate is Halloween. Although what God did for me through Christ, took my place! is something I do remember and am thankful for, every day of the year, I love having a time to really set aside to focus on these truths. Love your cookies, so cute and fun! I’m the same as you!! Dude, my dad is a pastor and he doesn’t really celebrate these “Christian” celebrations. Which is why I don’t think people should get offended if we wish them a Merry Christmas or Happy Easter. It’s a secular celebration! Worshipping Christ isn’t through mere annual commemorations. I actually feel kind of the same way but I think that these holidays are good for people who maybe don’t think about their faith on a daily basis…at least it forces them to think about it a few times a year! I think you have a good point…but then again, if a person isn’t thinking about their faith or God on a daily basis, do they really have faith? Food for thought. I also think your point is good in that even people who don’t believe might come to church during a holiday like Easter or Christmas and maybe their hearts will be pricked and they’ll want to learn more. But when it comes down to it, if all churches taught from the Bible and left the Easter egg hunts, concerts, rummage sales, etc at home (all things that aren’t the work of the church), we would be learning more from the Bible and things would be a lot less confusing (not to mention scriptural). I’m loving all these comments, it’s giving me and Dennis a lot to talk about during our nightly walks, and making me examine my own faith and beliefs.